That's a pulao and not biryani, Hemendra Singh Ji corrected me when I called it biryani, almost in a slip of the tongue. I knew instantly that the food is considered kosher in this household. A pulao is much more delicate than a biryani and needs more precision in the cooking process. 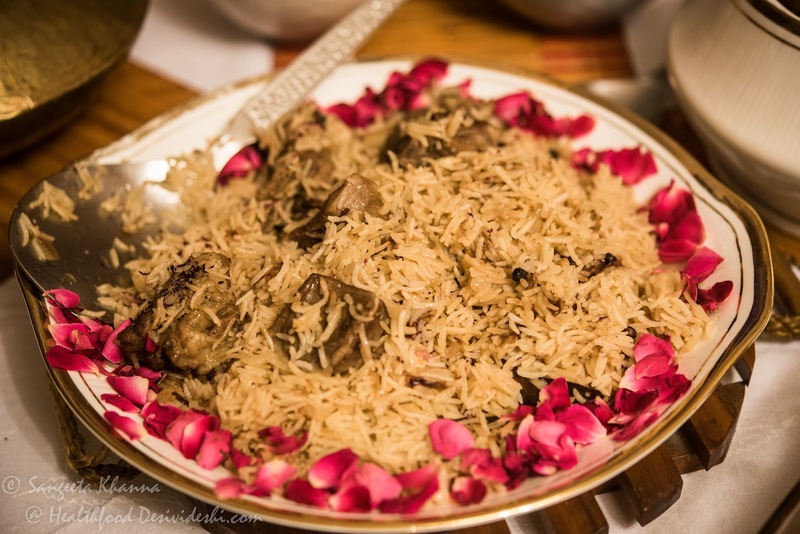 And this pulao was a real treasure, infused with fresh rose petals and mild hint of aromatic spices, the meat not spicy and the rice that imbibes the flavours of the meat, and yet the rose petals shine through. 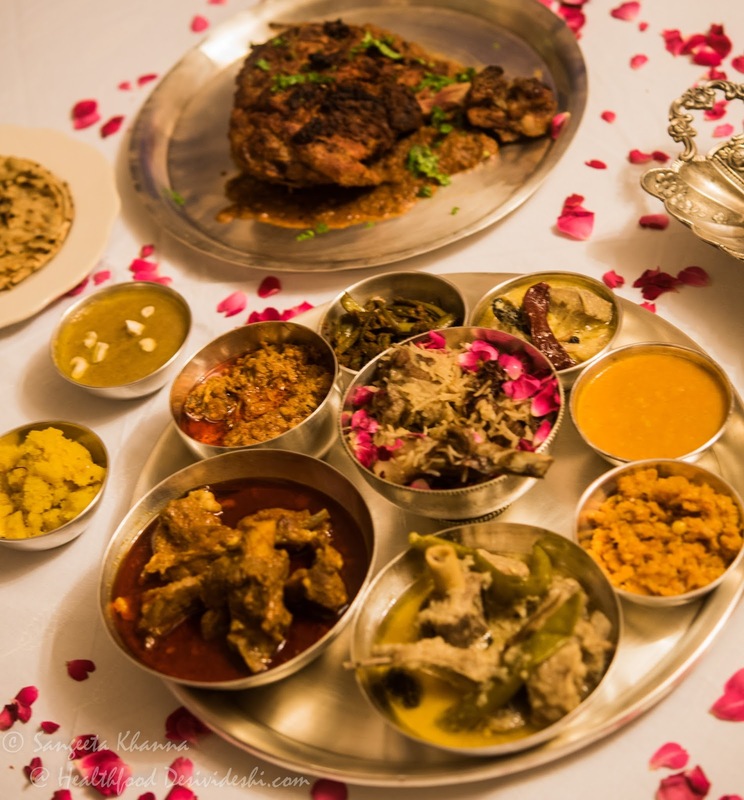 The kind of food one eats with all the senses and remembers for ever, that's the food you will get when you are dining with Bhainsrorgargh royals. Bhainsrorgarh is a principality located along the river Chambal, another river Bamani flowing along the other side of the Bhainsrorgarh fort, which has an interesting history dating back to 2nd century BC. The present day fort is now a heritage luxury hotel, built in 1740s and run successfully by the erstwhile royal family to which Hemendra Singh Ji belongs. We had attended a grand dinner at ITC Maurya last month, called as the royal high table, celebrating some of the royal cuisines of the country where the royal families of Kangra, Sailana (Madhya Pradesh), Akheraj (Rajasthan), Bhainsrorgarh (Rajasthan), Rampur (western UP), Salarjung Hyderabad), Kashmir (Dogra cuisine) had showcased their cuisines and it was such a sensory delight. Chef Manisha Bhasin and her team had curated this high table and the royal family members had cooked all the food themselves, the guests were seen licking their fingers and talking about the food endlessly. 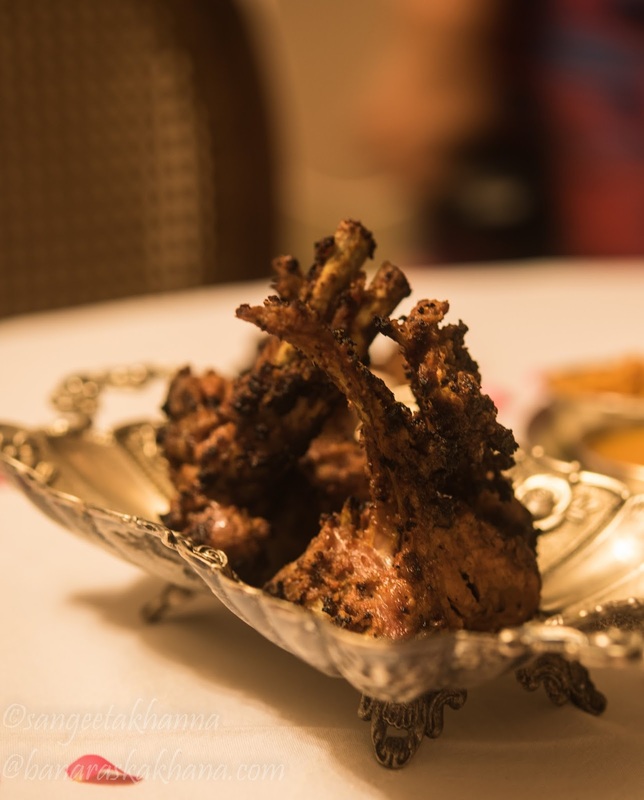 One of the most intriguing cuisines that we came across at the ITC Maurya royal high table was the Bhainsrorgarh cuisine which has taken influences from Mewar and Marwar regions of Rajasthan and is essentially a Rajputana cuisine depending heavily on game meats and local vegetables and grains. The makai ka soweta (main course) and makai ke kan (dessert), the safed Maas with green chilies and pulao had me smitten and luckily I got an opportunity to be hosted by Hemendra Singh Ji and his better half Vrinda Kumari Sigh last month. It turned out to be such a treat that we will remember for a long time to come. 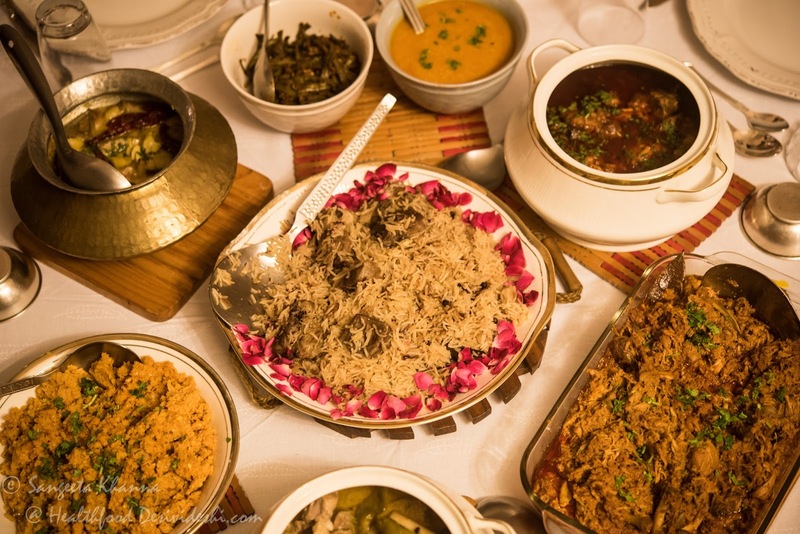 The food and the family stories interwoven together, the flavours and how they came into the cuisine, the family rituals around food were shared generously by the royal couple, leaving us mesmerized. 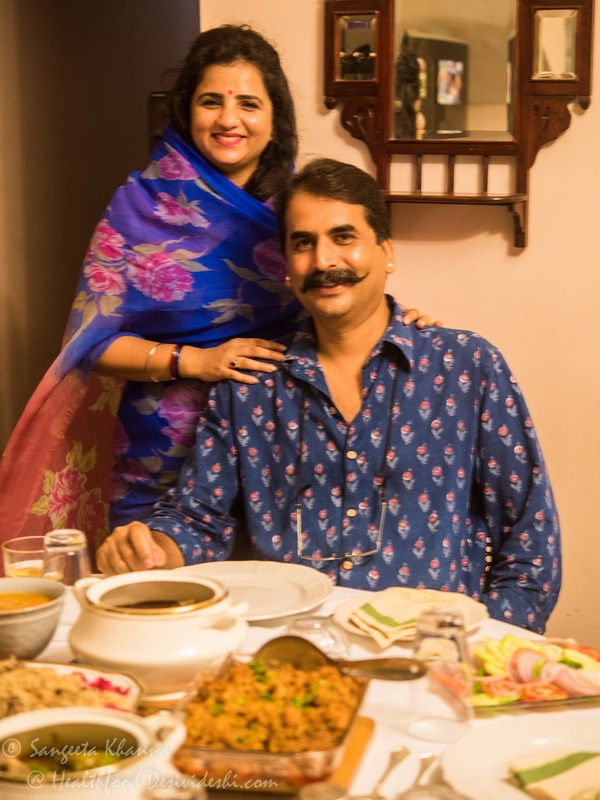 The dining table was laden with so much food I wondered if we will be able to taste everything and do justice to the taste, but among the family stories, food fables and recipe discussions the time just flew past and it was midnight before we realised. Hemendra Singh has a legacy of great cooks in his parents and grandparents but the most interesting fact is that he has done some improvement to the traditional recipes in terms of balancing the flavours and presentation etc., and the result is spectacular. He still takes pride in cooking all by himself and all the food was made by the couple themselves with little help from their staff. I will talk about the most uncommon foods that we tasted at their home first. The Chakki ke sule were actually pure wheat gluten marinated really well, skewered and grilled to perfection, retaining its meaty and moist texture intact. 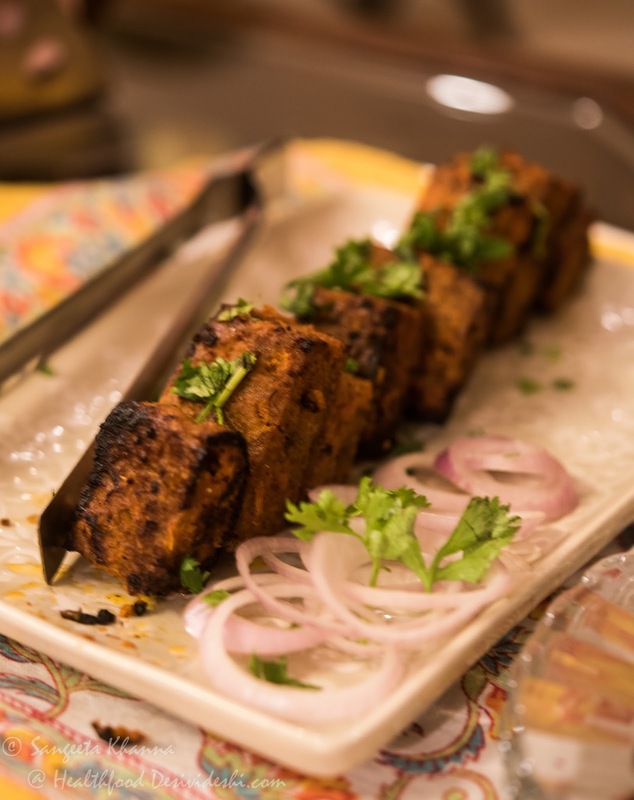 The Bakre ke chaap I remembered from the ITC Maurya buffet, very well marinated and wonderfully grilled, establishing the fact that skillful grilling enhances the flavour of meats. The Sabut Bakre ki Raan was a delight to dig in, marinated with an aromatic blend of spices along with figs paste that gave it a wonderful texture and earthy sweet flavour too. Makai ke kan (a dish like makai ka kees, almost like upma, made with fresh corn) is a breakfast dish, served as a snack sometimes, made a wonderfully light main course dish too. The same fresh corn was used to make makai ke meethe kan, a dessert that is a rustic dessert distinctly different from other Indian kheer recipes. 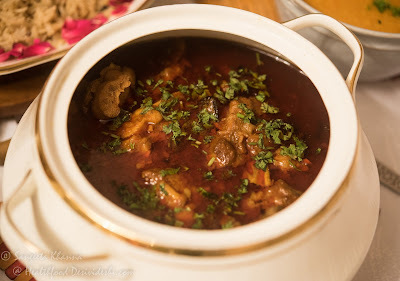 The guwar phali ki subzi, made with tender guwar and lots of garlic and coriander etc. was a delight to taste. Guwar grows a lot in Rajasthan and it is cooked like a staple vegetable, I was glad to see guwar being included in the menu as a representative of local flavours. Jackfruit was cooked in a milky stew without spices and tasted nothing like I have had with jackfruit before. Served in a heirloom brass handi this Doodhiya Kathal was something to remember. The safed Maas with Hari mirch was another dish that I can't stop raving about. Subtle flavour of green chilies, mildly hot and so flavourful, this safed maas was my favourite at the ITC Maurya showcase as well. This is absolutely my kind of meat curry. A chicken curry that was made in the ghutwa (pulled meat) style was another gem, we were told it was named after the Nawab whose recipe it was, called as Nawab Narendra Baksh chicken. The simple looking yellow dal called as Dal Bidwal was such an unsuspecting gem on the table. Perfectly cooked, ghutwa (slow cooked and completely disintegrated) dal redolent with garlic and ghee made for a lovely pairing with the Batiya roti, made perfectly by their kitchen help. 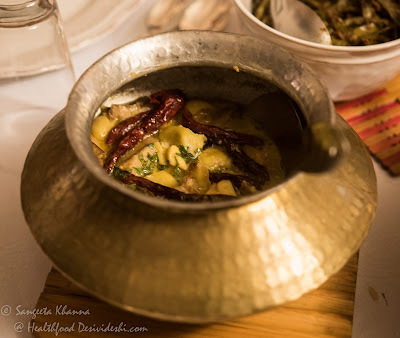 Jholdar desi Maas is an everyday meat curry and we were told it is eaten in a specific way for homely meals. The Batiya roti (a rustic flaky roti) is kept at the base of a shallow bowl called as Tasla and the meat curry is poured over the roti directly. One starts breaking the roti from the sides while it keeps soaking in the centre and gets even more delicious by the time one eats the last morsel. Such simpler traditions are rarely talked about at royal tables and I admire Hemendra and Vrinda Singh for keeping alive such homely traditions. 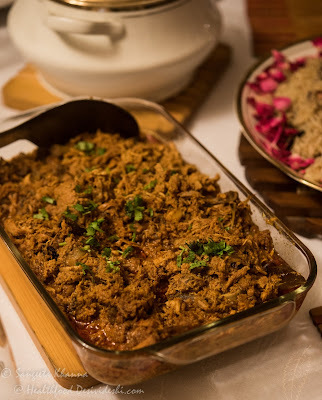 Last but not the least, the Gulabi Pulao where every grain of rice soaked with the flavours of meat and roses, both blending in perfectly along with mild spicing. The dessert, along with the meethe makai ke kan, was an intriguing dish called as Amrit Ghutka. It was a chana dal halwa, made in porridge consistency and the name was given by Hemendra Singh's father who was a poet and very fond of naming dishes poetically. Amrit ghutka is something heavenly that slides down the throats quickly. 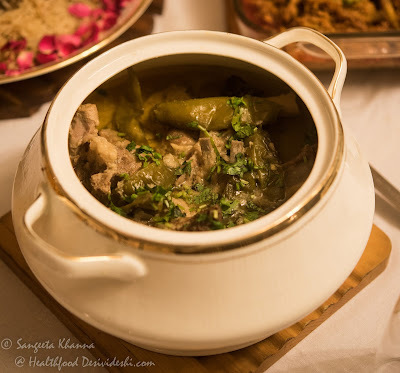 Hemendra Singh has definitely taken his Rajpootana cuisine a few notches higher with his own inputs, the good news is that they are into the business of catering too and deliver their Rajpootana Kitchen food all over Delhi and NCR, on prior booking. 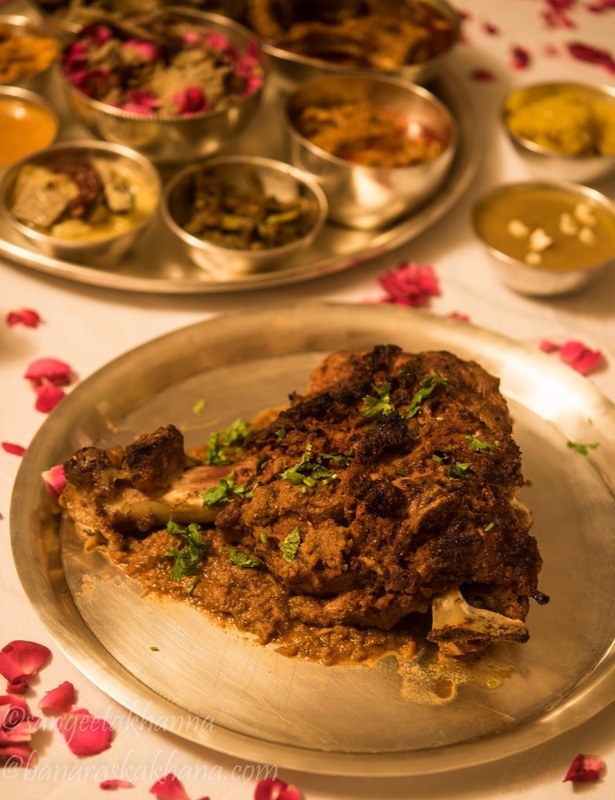 I was told they serve the same food at the Bhainsrorgarh fort Hotel as well, tempting me to plan a visit to the idyllic destination it looks like. I will tell you more when I visit Bhainsrorgarh which is quite close to Kota. The pictures of the majestic fort by the deep gorge of Chambal tempts me more. Stay tuned for more stories about Bhainsrorgarh.